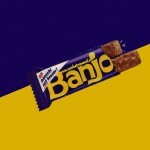 Banjo is a chocolate bar once available in the UK. 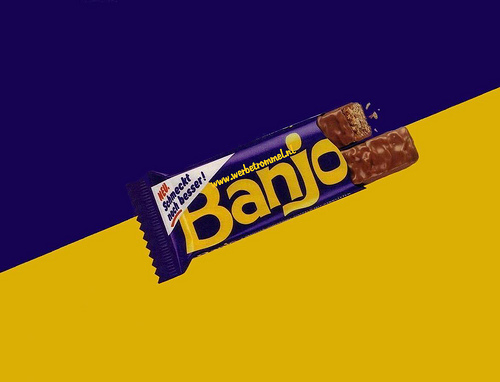 Introduced with a substantial television advertising campaign in 1976, Banjo was a twin bar (similar in shape and size to twix) and was the same as a drifter but with a chopped peanut layer and the whole covered in milk chocolate. It was packaged in distinctive navy blue – with the brand name prominently displayed in yellow block text – and was one of the first British snack bars to have a heat-sealed wrapper closure instead of the reverse-side fold common to most domestically-produced chocolate bars at that time. It was available into the 1980s. There was a coconut version also available in a red wrapper with yellow text.